Mühltal, July 28th 2015 – Desired material, indication, needed milling tool: every dental restoration is different. Most dental technicians therefore have multiple milling machines by different producers to ensure having the optimal solution for each task. The major disadvantage: many producers build their machines specifically for their own tools, by using special shank diameters or individual limit stop rings. This way, ordering tools for several different milling machines can become very time-consuming and unproductive. 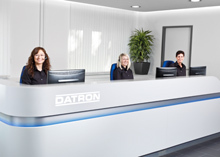 DATRON AG, producer of the successful dental milling machines D5 and D1 pure, as well as dental materials and milling tools, offers a solution for this problem: Compatible tools that can be used in current, non-DATRON systems. Oliver Premke, tool expert of DATRON’s dental sales team, explains: “Many dental technicians ask us about this. When we celebrated our ‘DATRON 4(0).0’ festivities with an open house for our dental customers, compatibility was one of the major discussion topics. DATRON specifically develops its dental milling tools so that they can be used in non-DATRON machines.” Most importantly: DATRON dental milling tools deliver the same high-quality results when used in non-DATRON systems. “By using our patented dental milling technologies, like our solutions for efficiently milling zirconium oxide with diamond-coated tools, customers can increase their dental restoration’s surface quality in most cases. The long lifespan of DATRON tools also ensures that customers need to order replacements less frequently – which saves money”, says Premke.